Autumn: Sunday March 26th to April 1st. Spring: Monday September 25th to Sunday October 1st. ... All at Copmanhurst N.S.W. Applications and deposits due 3 weeks before workshop starts. Application forms available early 2017. Basic prices ; 26 string W/S $950, 31 string $1150, 36 string $1550. Small increases may apply for 2017. Welcome: Thank you for visiting our Site. 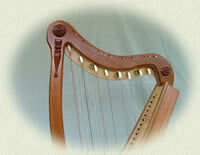 We aim to provide a complete Harp Service. Read on to find out what we can offer. Geoff, an expert harp-maker, lives at Copmanhurst near Grafton in eastern Australia where he makes hand made Celtic harps, and holds harp making workshops. These are very popular and many people have made their own beautiful harp by attending these workshops. No prior woodworking experience necessary. A wonderfulrange of beautiful Celtic harps. All beautifully made featuring lovely sound quality, easy to play and available with or without levers. All use the divided neck and machine tuners for easy tuning and lightweight. Choose from lap-harps and floor standing harps and your choice of woods and colours. 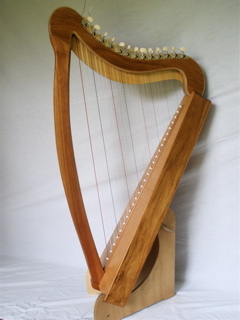 All harps are strongly made with laminated neck. 1. 31 string harp in Australian Red Cedar with Hoop Pine marine ply back and soundboard. All nylon strung, range: D bass(2 Octaves below Middle C) to F treble. No levers available. 3. 31 string harp in Australian Red Cedar with Hoop Pine marine ply back and sound board. All nylon strung, range : F bass(1 and half octaves below middle C) to A treble, No levers available. 4. 31 string harp in N. G. Rosewood with Hoop Pine marine ply back and sound board. All nylon strung, range: F bass(1 and half octavesbelow middle C) to A treble. No levers available. 5. 26 string lap harp in Australian Red Cedar with Hoop Pine ply back and sound board. All nylon strung, range: C bass(1 octave below middle C) to G treble. No levers available. 6. Standard 26 string lap harp in Qld Maple with Huon Pine sound board,oiled finish, with 3 sound holes in sound board. All nylon strung, range: C bass to G treble.Camac levers on B,C,F,and G strings,( more can be added @ $26 each). Telescopic legs also available for this model, $50 a pair. Small fault in sound board repaired, discount $50. 7. Standard 31 string harp in New Guinea Rosewood with King Billy sound board. All nylon strung, range: F bass to A treble. Camac levers on B,C,F,and G strings,(more can be added @ $26 a pair). 8, Standard 31 string harp all in Silver Quondong, including the sound board,( creamy/silver colour). All nylon strung, range: F bass to A treble. Full set of Camac levers. Small pickups fitted $65 extra. A few screw holes filled, discount $50. and providing the best of service to you.